Control Pandora, with Growl support and global keyboard shortcuts. PandaBar brings global keyboard shortcuts, Apple media keys, Apple remote controls, Growl notifications and more to your Pandora listening experience. 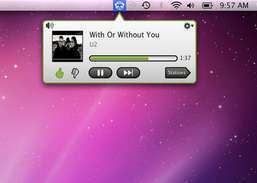 Play Pandora from your Mac menu bar. It works with both free Pandora accounts and paid Pandora One subscriptions. Shortcut keys, song info and artwork: iTunes keyboard and menu bar controller. 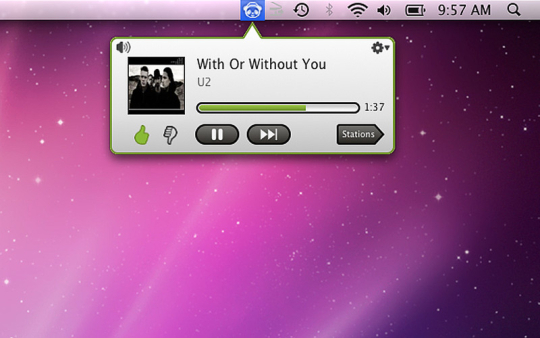 Menu bar music controller compatible with iTunes, Spotify and Rdio.